American author, naturalist, transcendentalist, pacifist, tax resister and philosopher who is most famous for Walden. "A Winter Walk." The Dial (October 1843): 211–226. "Martyrdom of John Brown." Echoes of Harpers Ferry: 439-445. "Walking" in The Atlantic Monthly, 9 (56) (1862): 657-674. "Autumnal Tints" in The Atlantic Monthly, 10 (60) (1862): 385-402. "Life Without Principle" in The Atlantic Monthly, 12 (71) (1863): 484-495. "Night and Moonlight" in The Atlantic Monthly, 12 (72) (1863): 579-583. "The Wellfleet Oysterman" in The Atlantic Monthly, 14 (84) (1864): 470-478. "The Highland Light" in The Atlantic Monthly, 14 (86) (1864): 649-659. "DIED...Miss Anna Jones." [obituary] The Yeoman's Gazette 22 (25 November 1837). (1906) edition in 20 vols. Thoreau: His Home, Friends and Books by Annie Russell Marble, 1902. Henry Thoreau's mother by Le Brun, Jean Munroe, 1908. Thoreau: As remembered by a young friend by Edward Emerson, 1917. "Thoreau" by Archibald MacMechan, Chapter X of Book II of The Cambridge History of American Literature, 1918. Thoreau by Henry Seidel Canby, 1939. Thoreau's library. by Harding, Walter Roy, 1917-1996. Published 1957. 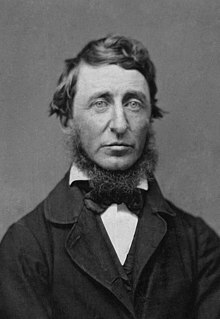 “Thoreau, Henry David” by Joseph McCabe in A Biographical Dictionary of Ancient, Medieval, and Modern Freethinkers, 1945. “Thoreau, Henry David” in Encyclopædia Britannica (9th ed., 1888).